Finished! 24" x 18" oil on box canvas. Thoroughly enjoyed this one and (unusually! )I am actually really pleased with it! Didn't retouch during painting in the end so looking forward to seeing the colours pick up and the darks deepen when it is dry enough to add a coat! Have decided 'Mounted Branch' is a bit of a rubbish title for this painting... need to think of a new one. Anyway, today's update above. 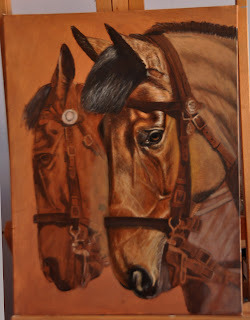 Not a million miles off finishing now- lots of tidying up to do on the bridle mainly and a few tweaks here and there. 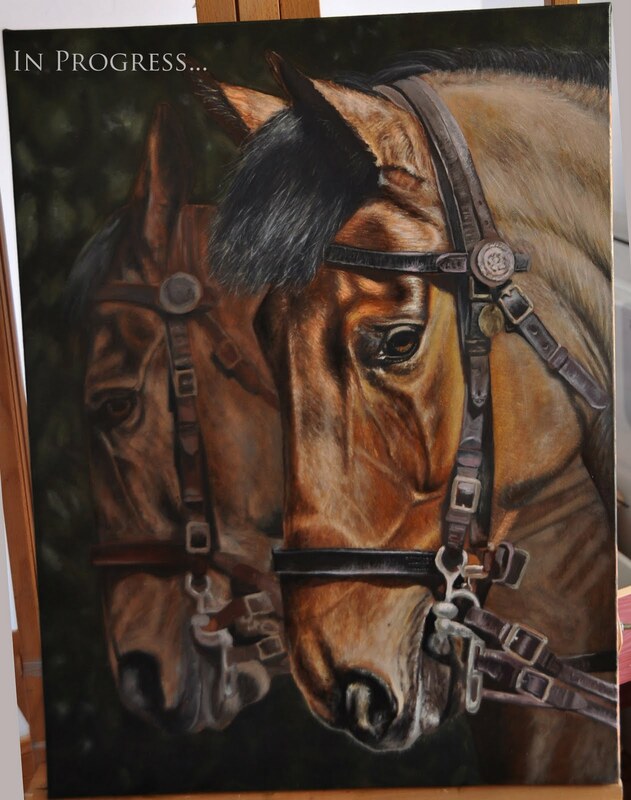 Will probably fiddle on with the bridle a bit more this evening once the children are in bed and then leave it to dry over the Easter weekend in order to retouch varnish it on Monday and see where I'm at! Some serious progress made! Background in, far horse roughed in, and work started on the bridle of the near horse. 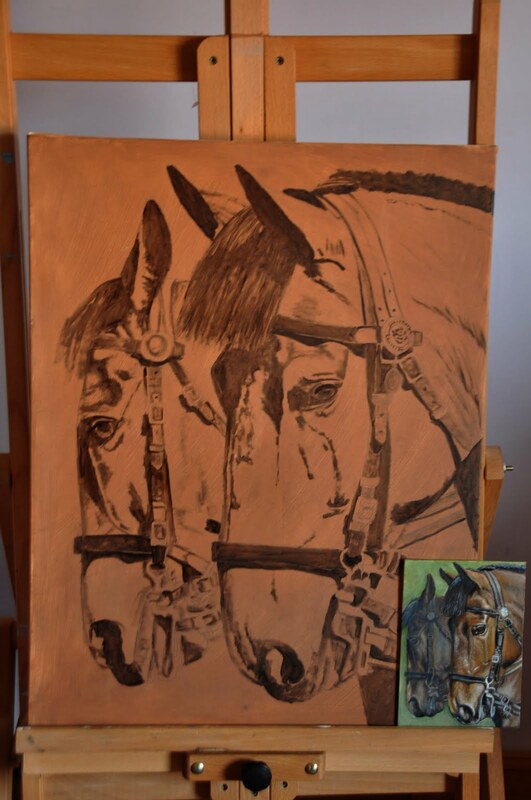 Once I have got this layer of the bridle done I plan to let it dry completely and then apply a coat of retouch varnish. The dark areas dry quite a sunken matt colour so it's hard to tell where I'm actually at with it all! Once the retouch varnish has dried it will have evened everything out and I'll be able to have a much better look at what needs building up some more. More on this today- blocked in the first base layer of the background and started the neck detail. It's on a box canvas but the more I paint the more I think it might look better framed... need to decide really before I put too many hours into painting the edges! Have been sat out in the garden doing some painting. 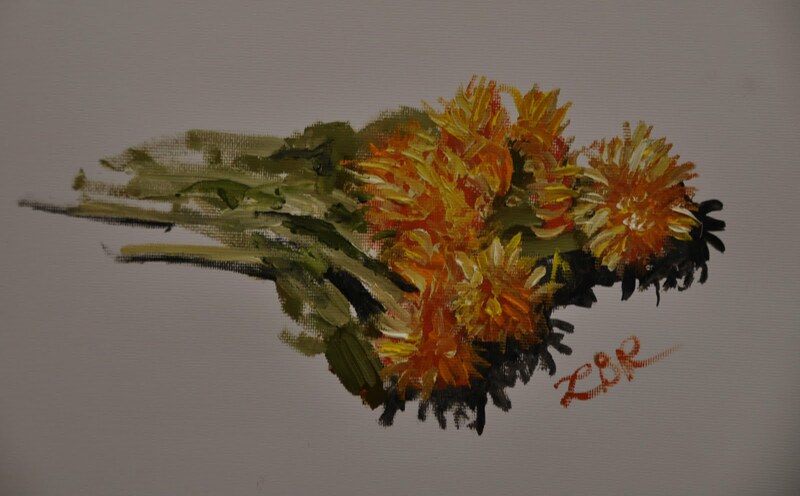 My 365-2011 project fell by the wayside a bit but I am still really keen to keep up with my paintings from life as I really do reap the benefits in my 'normal' work in terms of my observations skills, grasp of colour and value and so on. Another three hours on this today- made a good start on the muzzle and built up the face a bit more too. I plan to try and leave the face alone now and get the rest of the horse up to speed so I can fiddle with it as a whole rather than little bits. 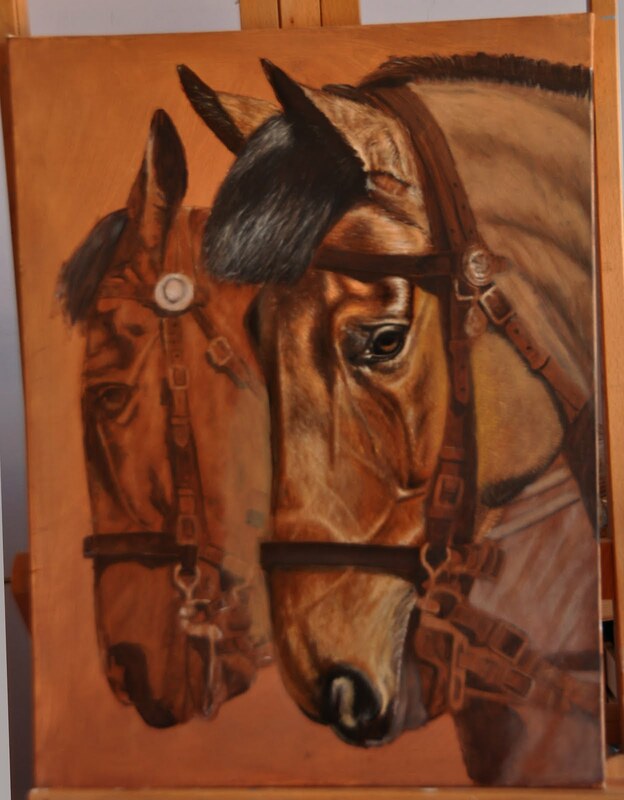 Once the closest horse is done I'll move the the background, then the farthest horse, and then finally I'll do the bridlework I think. 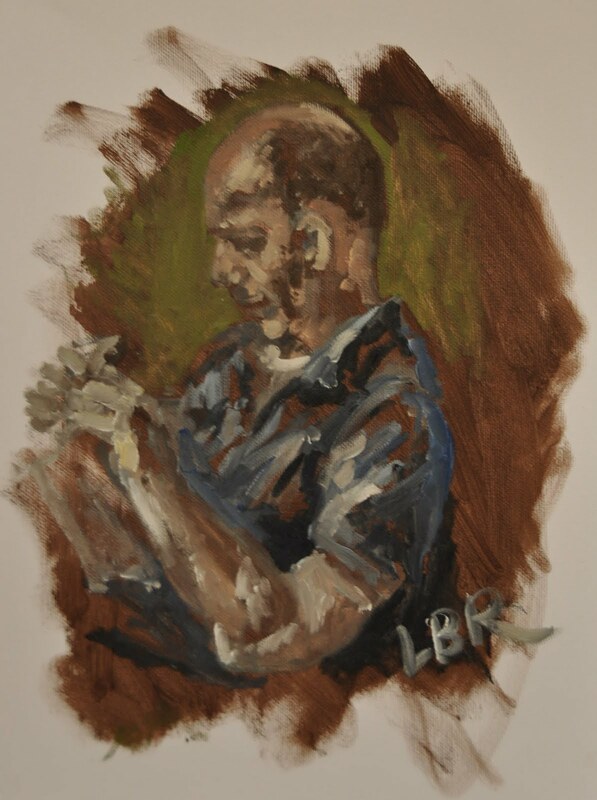 The auction of the 7" x 5" study of this painting finishes on eBay tomorrow evening- http://cgi.ebay.co.uk/ws/eBayISAPI.dll?ViewItem&item=180651911619 it's currently at £41. Most recent update above, previous layer is pictured below. Another darker glaze of burnt umber went over the horses completing the underpainting, so now I am on to the detail. I added a bit of exaggerated hair texture last night, and worked on the eye- today I have been building up colours and tone and starting to try and correct the face a bit as it is a bit chunkier than the actual subject (quite a bit more to do on that front!). Day 3 of 'Mounted Branch' in progress. Top picture is where I am up to so far today, pictures below are a few shots from yesterday (earliest photo at the bottom). 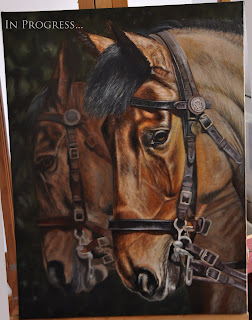 Hope to get some more done on it later in the day if I can fit it in with commissioned work I need to focus on. I'm enjoying the lighter evenings- much easier to see what I am doing during my daily post-childrens-bedtime painting slot! So far I am just building up the underpainting really, using burnt umber mixed with french ultramarine for the darks and titanium white for the lights. 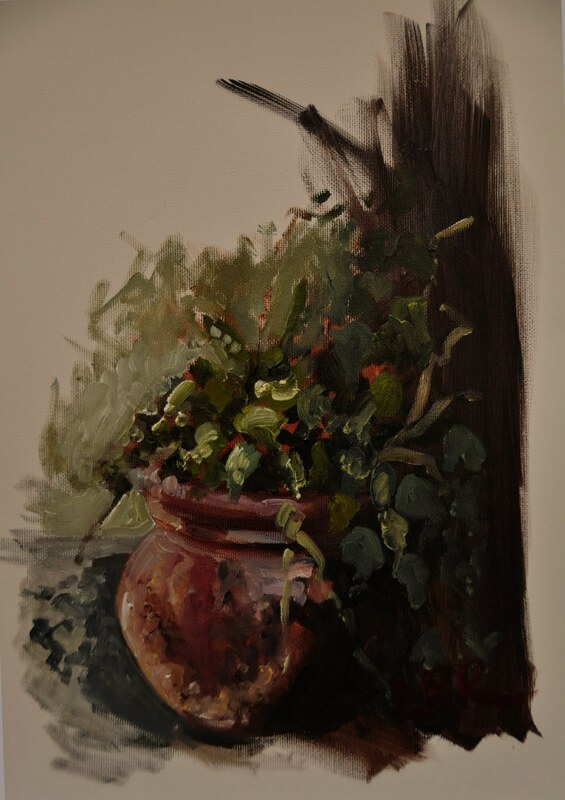 Once I have established the main areas of light/dark I am glazing over it all in burnt umber and repeating the process. Later on today I'll glaze it again and then decide whether to do it for a third time or start with some more detail over the top. I recently bought some little foam rollers to try which I used to gesso this canvas- I absolutely love the surface they have created- super smooth after lots of sanding but not as 'slippy' as my usual finished surface. Much, much quicker than using a brush too and dead easy to clean up after- recommend! 'Mounted Branch' New painting in progress... day 1! Made a start on my next original painting, thought I'd keep a track of my progress on here- something I haven't done for a while! It's a 24" x 18" deep canvas, gessoed and sanded until smooth. So far I have toned the canvas a burnt sienna/umber, applied the drawing over the top, and painted in the main areas of dark. 'Mounted Branch' (Study) ready for eBay. This weeks 7" x 5" mini original for eBay, 'Mounted Branch'(Study). 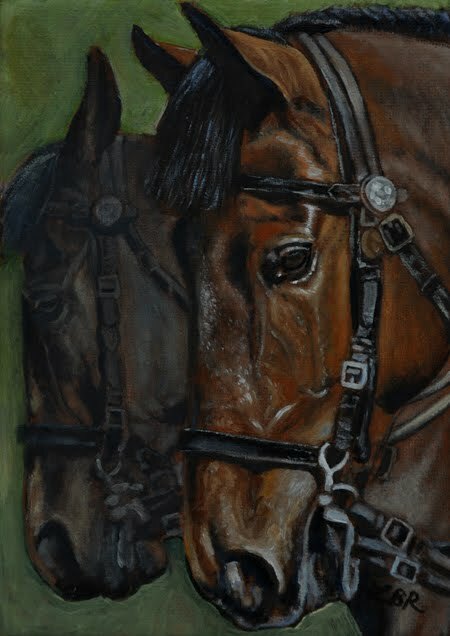 I loved painting this and have started a larger painting of the same subjects. The auction begins at 7:35pm this evening- http://cgi.ebay.co.uk/ws/eBayISAPI.dll?ViewItem&item=180651911619. 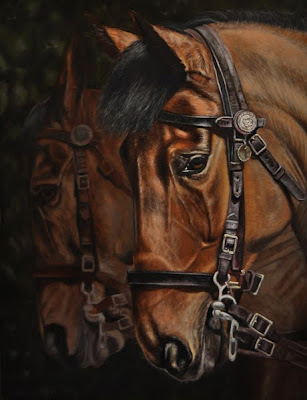 It's based on photos I took at the Association of Animal Artists Annual Exhibition last Sunday, you can see photos of my day there painting the police horses from life in a Facebook album here. 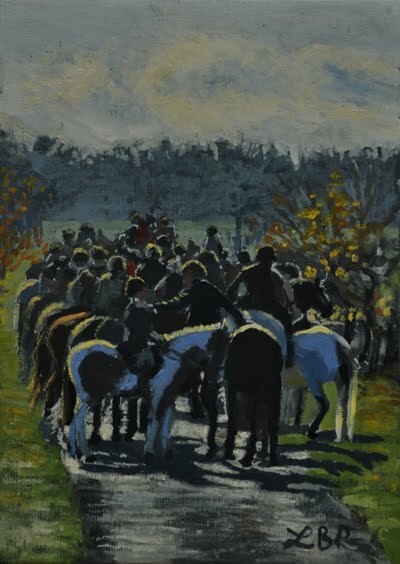 Off to the Bedale point to point this afternoon with my camera, the weather is glorious so I am hoping for some great shots! My favourite of my mini originals so far I think, which surprised me as I painted it fully expecting it not to work at all! That is the beauty of these little 7" x 5" eBay paintings, they are small enough to try out ideas that you perhaps wouldn't do otherwise.